project: Armstrong Residence II, 1938. 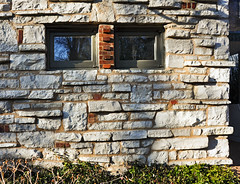 This detail of the stone and brick masonry facade created by Armstrong illustrates his intentional, considered reuse of remaining masonry from an earlier 19th century stone foundation on the site. The brick and stone wall creates a kind of one-story mask for the combination house and architectural office. See information below for details on the house tour. Tickets are limited, so make your reservation soon. I will be presenting a special slideshow during the "after party" so consider attending if at all possible. 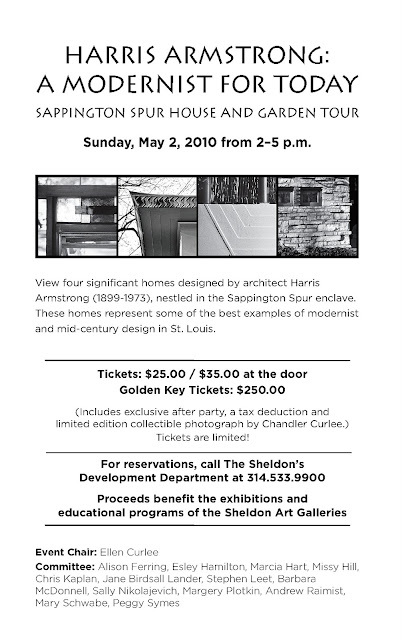 Funds raised through this event will benefit the Sheldon Art Galleries exhibitions program. Photographs copyright © 2010 Andrew Raimist. A photograph taken by Charles and Ray Eames will be available for auction through Wright20. I've examined an extensive range of photographs and portraits of Isamu Noguchi and have never seen this image published or available online previously. Isamu and Shirley are shown standing outside the Eames House in Pacific Palisades, California. The house is an amazing work of art, a modernist box of glass and steel informed by a wide range of influences including neoplasticism, Japanese design, and indigenous cultures the world over. Noguchi and the Eameses seem to have had a fruitful relationship personally and professionally. 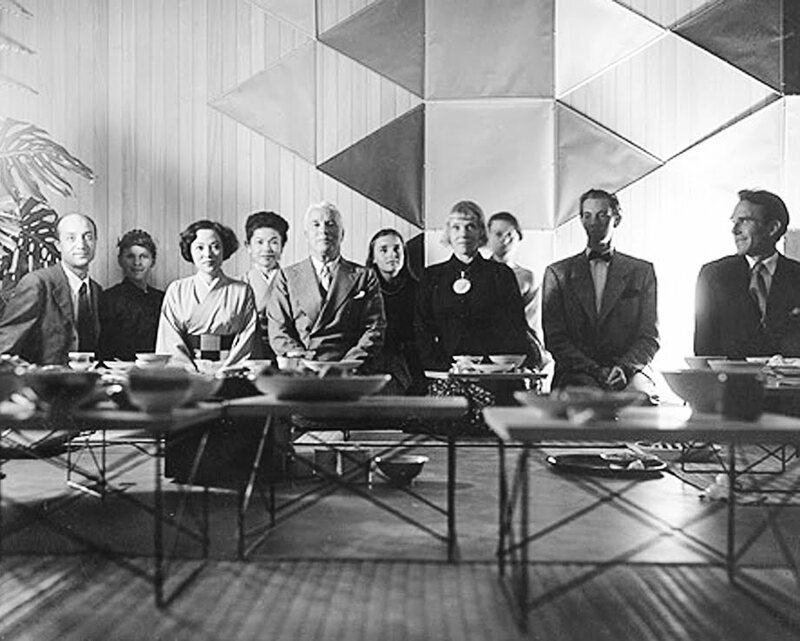 This photograph (from the Library of Congress) taken by Charles features Isamu Noguchi, Shirley Yamaguchi, Charlie Chaplin, Charles Eames and others at a Japanese tea ceremony held at the Eames house. Practical in so many milieus, the tables gave the Eameses the perfect place to serve chanoyu, the traditional Japanese tea ceremony, to special guests, such as sculptor Isamu Noguchi and film star Charlie Chaplin. 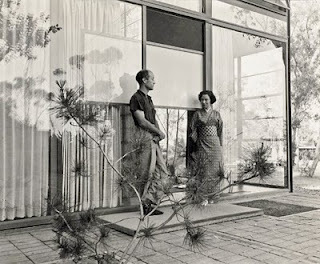 The portait of Isamu and Shirley standing outside appears to have been taken on another occasion since Noguchi and his wife are dressed more formally in the tea ceremony image. 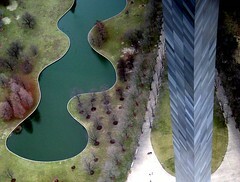 There have been other images including them together at the Eames home, including some taken by Noguchi himself. For example, a series of negatives in the Charles and Ray Eames Collection of Library of Congress includes series images attributed to Noguchi as photographer. These images are dated 24 July 1951. This series appears to have been exposed at the same event as the larger one above (including Charles and Isamu) that is attributed to Charles Eames. The first three of this series seems to show the entire group attending the tea ceremony (less Isamu). The fourth and fifth images include Charlie Chaplin and Shirley Yamaguchi. The final image is a close-up of Chaplin clowning around with a fan. Learn to see abstractly by looking for geometrical forms and compelling compositions despite the “subject matter”. A good way to sidestep preconceived images is to consider a subject that’s commonly photographed, a well-known icon. To learn to “see creatively ” we should approach the subject in a more personal yet more detached manner as if you were a child experiencing it for the first time. This manner of “seeing” isn’t natural for many. 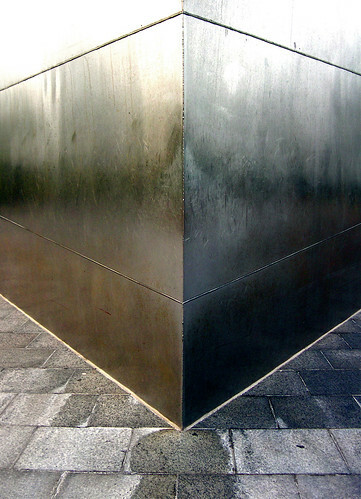 We “know” what the Statue of Liberty, Washington Monument, and Gateway Arch “look like.” We need to reconsider these subjects “abstractly” as two-dimensional forms without reference to its well-known image. Look for suggestive forms, shapes, and lines for creatively framing you image. The actual “subject” is secondary. Your task is creating a compelling photograph. Use ambiguity to achieve a meaningful level of abstraction. By abstraction, I don’t mean, “Something no one can possibly identify.” Rather I mean forms suggestive of other things eliciting emotional reactions. Frame the subject from an unusual viewpoint or limit the image to a fragment of the subject. Work to perceive the two-dimensional forms displayed on your screen as an interesting composition on its own grounds. 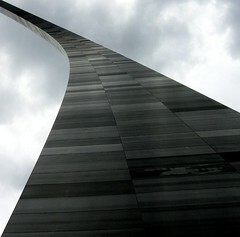 My view of the Gateway Arch was taken looking up one leg and then adjusting my view until the arch’s top touched the corner of the frame. A DSLR ’s LCD display is helpful. Use the framed forms in the display to test possible compositions. Look for shapes suggestive of other objects with multiple references like an ear, tongue, road, or other identifiable form. A higher density of references enhances a photograph’s potential richness and power. Try shooting in series.. Become fully engaged visually and physically. Move around adjusting view, position, zoom, etc. Continue exploring alternative viewpoints until you feel perhaps you’ve accomplished a step in the right direction. Evaluate your images later on a monitor rather than trying to prejudge what is good or bad on site. Note: This blog entry was previously published on the Digital Photography School site with the title "Learn to See Abstractly" as a guest post. I've reposted it here upon request.